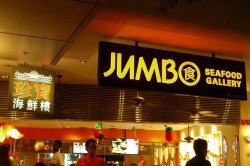 Providing the best quality of food and service, Jumbo has gained its reputation as one of the popular Seafood Restaurants in Singapore. Patrons were pampered with the extensive choices in Menu, live seafood was ready to be ordered too. Rather crowded by the time we reached, yet their arrangement for upcoming guests was organized. 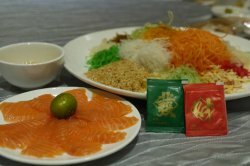 Today is the seventh day of Lunar New Year, of course we celebrate it with “Yu Sheng”. Available only from 17 January 2014 until 14 February 2014, festive mood was bursting up. Restaurant was fully booked, luckily we made our reservation one week in advance. Favourite platter which brought the meaning of Prosperity, it symbolized good luck throughout the year. A fresh ingredient with a lot of shredded veggies, pomelo and most important Raw Salmon, appearance was tempting enough. Price at $48.00 for smaller portion, it was worth to have it. Stirred up the dish with our chopsticks, we ended with our shouted word heavily: Huat Ar! !